I suspect I’m not alone in saying that each time I make my way through downtown Brussels to a Brontë event, I gather the aura of the old city as I go, preparing myself for another delicious escape into the nineteenth century. Depending on my mood, and whether or not the North Sea climate has graced the city with mist, I might imagine a little figure in grey on a cobbled corner, or a dark-coated gentleman disappearing down an alley in the park. 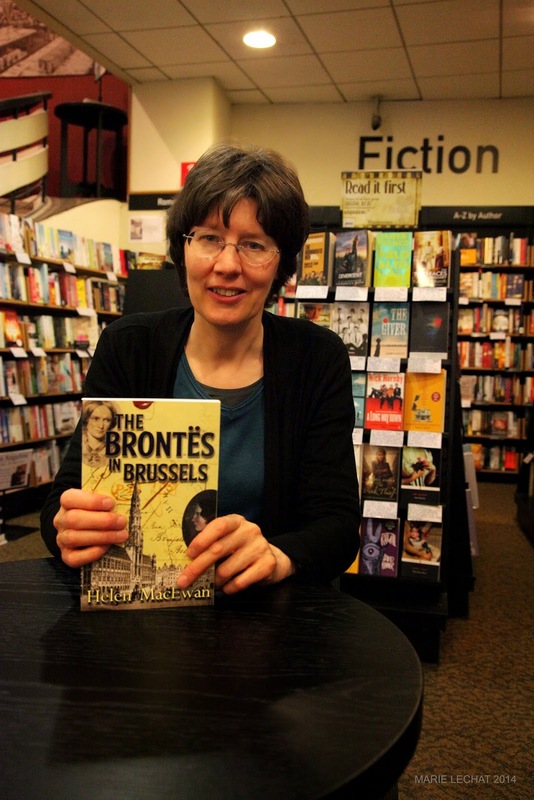 I’m sure I’m not alone in confessing that this time, on June 26, as eager as I was to welcome Helen MacEwan’s new Brontë book into the world (The Brontës in Brussels), other matters distracted my journey into town. That is to say, like many of you, I was rather preoccupied by the fate of the Red Devils later that evening as they advanced in the World Cup. Instead of little ladies in grey, therefore, dallying on forgotten corners, I spied Devils supporters in tri-coloured wigs and red horns brandishing lurid, plastic pitchforks, a spectacle that would surely have rendered poor Charlotte and Emily Brontë senseless had they encountered it (though not before confirming their deep suspicion of the Catholic faith’s puzzling obscurantism…). The above observations are not incidental to this little piece. Helen’s new book is, indeed, a journey back in time to the Brussels the Brontë sisters would have known in the early 1840s. No one can dip into these sumptuous pages without escaping contemporary Brussels – even in all her football finery. Along with a wealth of colour illustrations from the period. 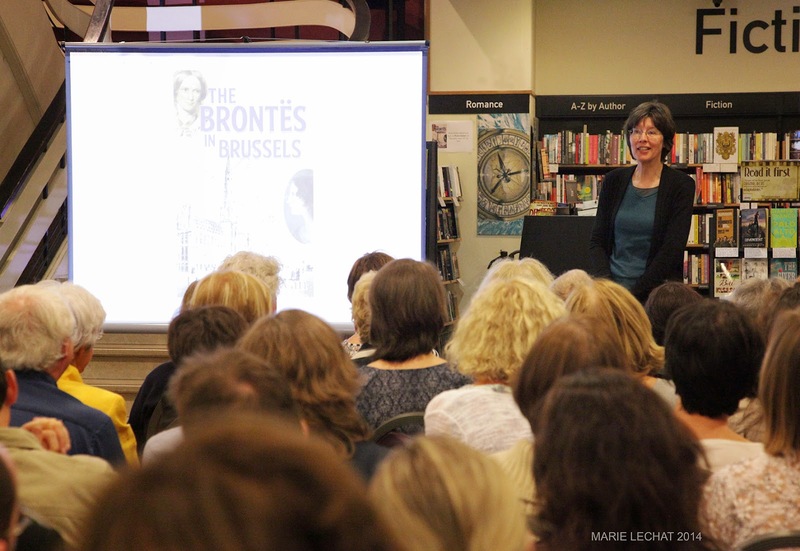 The Brontës in Brussels presents a fascinating look at how this city influenced the two sisters’ hearts and imaginations. Cogent details transport the time-traveller immediately: we follow Charlotte on a ramble along the Rue de Louvain, where she refreshed herself with a coffee and currant bun; we slip into an illustration of a wide, leafy boulevard with views over the surrounding countryside, and find ourselves at once elated and heartsick to touch this Brussels we will never know. Thanks to Helen’s book, however, this vanished city still has a pulse. She guides us to those corners where, if we close our eyes, we might still detect a horse’s hoof or rustle of silk in the endless drone of traffic. Such moments bring a familiar frisson to those of us who have spent many years in Brussels and fallen in love with her enigmas. Most moving of all is Helen’s inclusion of Charlotte’s letters to Constantin Heger. The stark intimacy of these confessions draws the reader far from Brussels, all the way to the moorland chill of Yorkshire and the grey-clad little woman who anguished there, in physical and emotional exile from her “promised land”. It is with a strange sort of clairvoyance that we read those letters, knowing as we do how Charlotte’s genius would eventually transform her despair into great art. Familiar faces as well as new ones could be seen in the substantial gathering at Waterstone’s on Thursday night. Helen presented a series of slides from her book while subtly drawing us ever deeper into the lost world just outside the door. By the time she’d finished, no one wanted to open that door and step back into real-time Brussels. After a series of stimulating questions (followed by some welcome stimulants of the liquid variety), Helen’s second Brontë book was successfully launched and her appreciative readers dispersed into the evening. 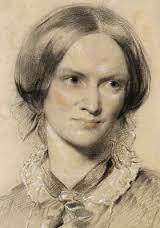 I found myself lingering alone at a bus stop in a sort of Brontë-induced reverie. Nearby, cafés were swelling by the minute with Red Devils supporters, and a passing pitchfork brushed my elbow. But these things barely registered this time. I had eyes only for the elaborate cornices overhead that a Brontë might have glanced up to admire; I kept watch out the bus window for the Cathedral of St. Michael and St. Gudule, trying to imagine what desperation had driven the anti-Catholic Charlotte to mount its steps and seek confession. 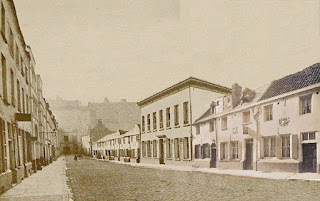 The bus traversed the mythical “Quartier Isabelle”, so lavishly illustrated in Helen’s book, and as I swept past the Belliard steps, they seemed narrower and steeper than usual, the flash of long grey skirt at their summit utterly unremarkable. Across from the Palais des Beaux-Arts, a man in a crowded bar was draping himself in the Belgian flag and downing a Jupiler. It’s proof of the early success of Helen’s book that he clearly seemed lost in the wrong century, for I was certain that I’d spotted the watchful Mme. Heger, bustling up and pursing her lips in disapproval. The bus had whisked me up the hill, however, before I could say for sure what her expression had been. World Cup, 0. 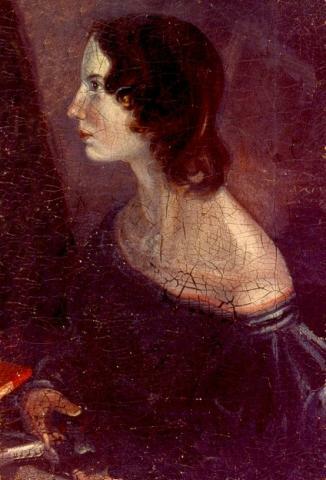 Brontës, 1.